"Light Up the Sky," written by Pulitzer Prize-winning playwright Moss Hart as a tribute to his friends in the theater, is the latest Laughing Stock Theatre Company production to grace the stage of the nexStage Theatre in Ketchum. It will be performed Wednesday, May 28, through Sunday, June 1. Hart also wrote "You Can't Take It With You" and "The Man Who Came to Dinner." "Light Up the Sky" is an inside glimpse of the horrors and comedy of creating a Broadway production. It is a behind-the-scenes look at the opening night of an off-Broadway, out-of-town preview mocking show business relationships and personalities at the edge of disaster. Moss writes a hilarious and over-the-top play about a business and art that manages to always survive. 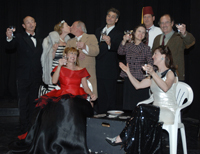 The play takes place in a suite in The Ritz hotel in Boston. It is backstage theater comedy with all the narcissistic, flamboyant and classic personalities one expects from the theater. "Laughing Stock has been hiring more equity people over the years," said the play's director, Keith Moore. "We did 'Art' and 'Nerd' to raise us up a level ... but we need to get back to our roots, which is a community cast. We looked at a lot of plays with big casts and 'Light Up the Sky' jumped out." Moore said all the parts are very meaty and it's an ensemble piece. There are newcomers to the group such as Bard Widmer as Tyler and veterans such as Dean Cerrutti, who has the lead role as Sidney Black. "Light Up the Sky" features the character Peter Sloan, a shy novice playwright. Sloan is played by Ketchum's Mackenzie Harbaugh the son of former Ketchum P & Z member, Anne Connock and grandson of Jack and Liela Connock. Harbaugh's character is very awkward in a sea of hardened theater people. "I do feel close to the character," Harbaugh said. "The character is supposed to be a decade older than I, and he is a playwright who has picked up miscellaneous jobs to pursue his passion and do what he loves to do. I am in Sun Valley doing the same thing, a starving artist doing what he wants." Harbaugh has been acting in a variety of Wood River Valley theater productions, including the Company of Fools, nexStage Theatre performances and Laughing Stock. He has done Shakespeare and performed in "A Christmas Carol" with "Light Up the Sky" director Keith Moore. "This is more of an adult play," Harbaugh said. "I still love acting and it's what I do. I've been cast in 'Hair' with St. Thomas Playhouse and in reprising roles with the Shakespeare Festival later in the summer." Harbaugh said community theater is a great deal of fun in Sun Valley because the audience and the actors know everyone and it's an eccentric group. "People will love seeing people they know doing over-the-top-comedy character roles," said Harbaugh. "It's a great show to go see on the weekend with friends. It's definitely not boring theater where you need to arm pull to get someone to go." For tickets and details, call 726-4tks.